NMM 8514. 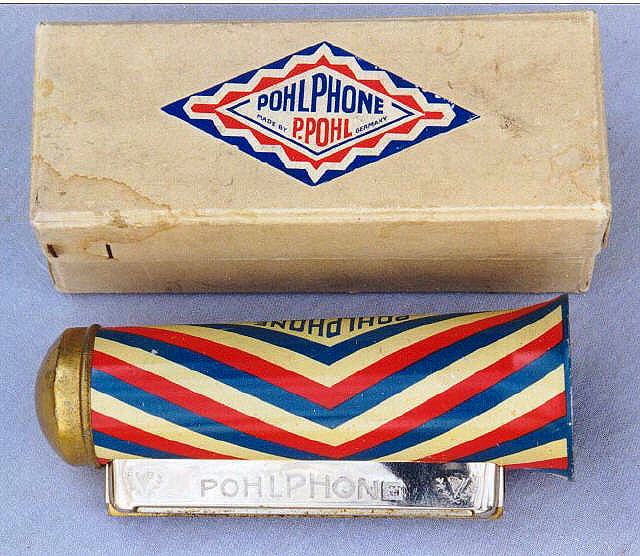 Pohl Phone resonator harmonica by Hohner, Trossingen, after 1908. Peter Pohl was a 19th-century harmonica maker in Klingenthal, Germany. In 1908, the Hohner company bought out Pohl's business and continued making cheap harmonicas under the Pohl trademark through the 1930s. This example features a red-white-and-blue striped, cylindrical resonator. Alan G. Bates Collection, 2000.